eye M online | No, really. I am! Wired the Arduino to take power from the 12V supply for the LED light ring. No longer have a need for a separate wall-wart to power the Arduino. Also upgraded to the latest version of grbl 0.9i. This has support for spindle control by default. That means that the function of pins 11 and 12 are swapped. I need to change the wiring on my screw shield to support the changed functionality. All working OK. When my SuperPID arrives I’ll be able to control the spindle speed from the part program. I expect a minor problem with the run signal for the SuperPID. It may require a small circuit to go to 5V when pin 11 is not 0V. We’ll wait and see. I bought a couple of 80mm diameter LED Angel Eyes on eBay for AU$7.75 from this seller. 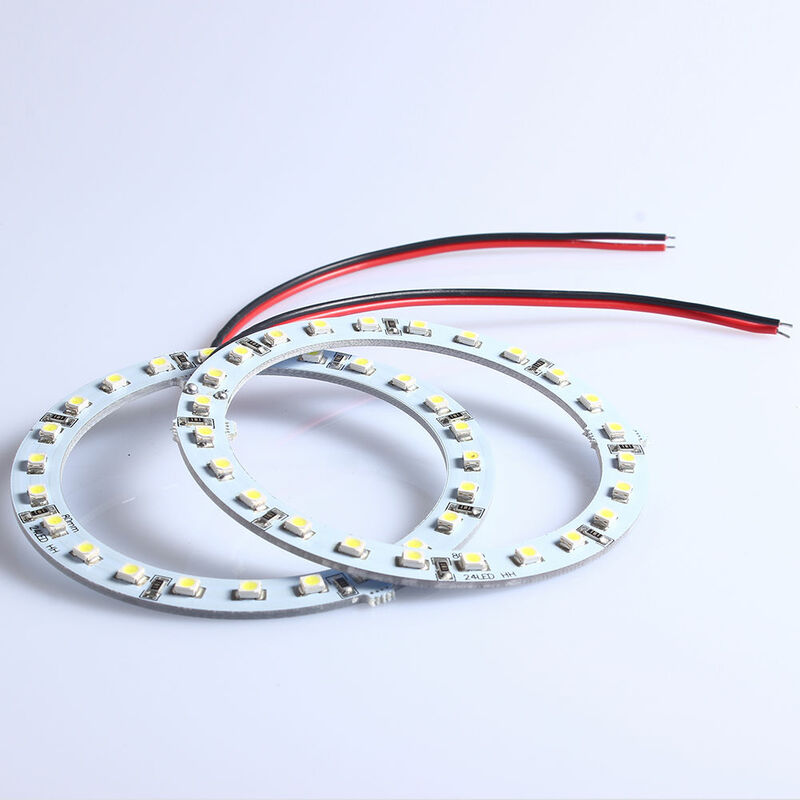 These LED light rings are designed to accessorise car head lights. The inside diameter should be large enough to go around the barrel of my Makita edge trimmer spindle. 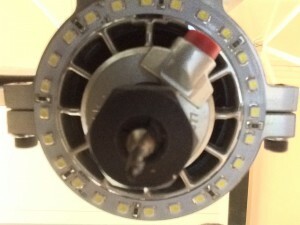 But I found the inside diameter was a little under the advertised 65mm. A little sanding and it fit nicely over my spindle. 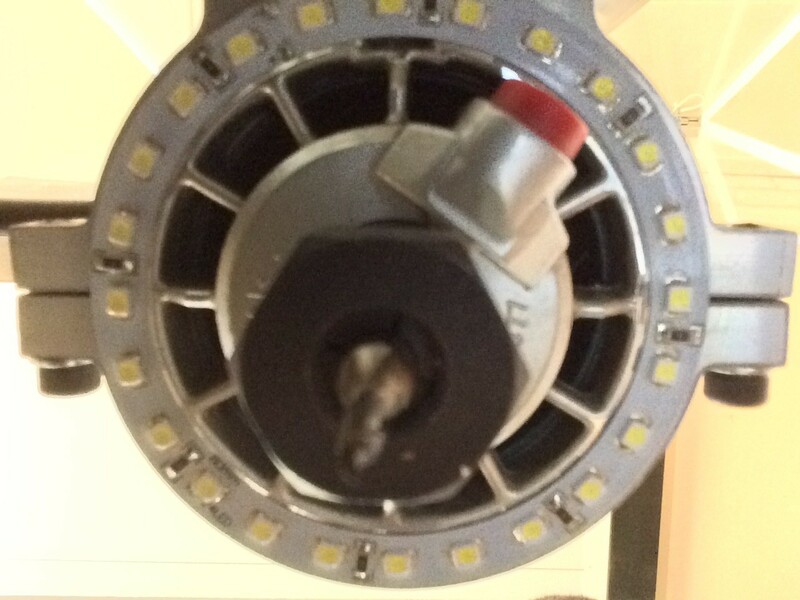 The lights rings also appear to be manufactured in several nested sizes. There are support tabs which can be seen in the above picture. These were also sanded off. The light ring is driven from an adjustable DC-DC converter. They light up at just over 6V and reach full brightness at 12V. I am really happy with the result. No more shining a torch into the enclosure. The effect is better with your eyes. The high dynamic range the light produces is hard to photograph. The new all aluminium pulleys are installed. The v-rollers have been adjusted. 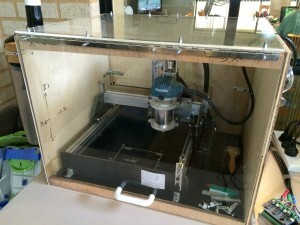 The Shapeoko is ready to run another job. 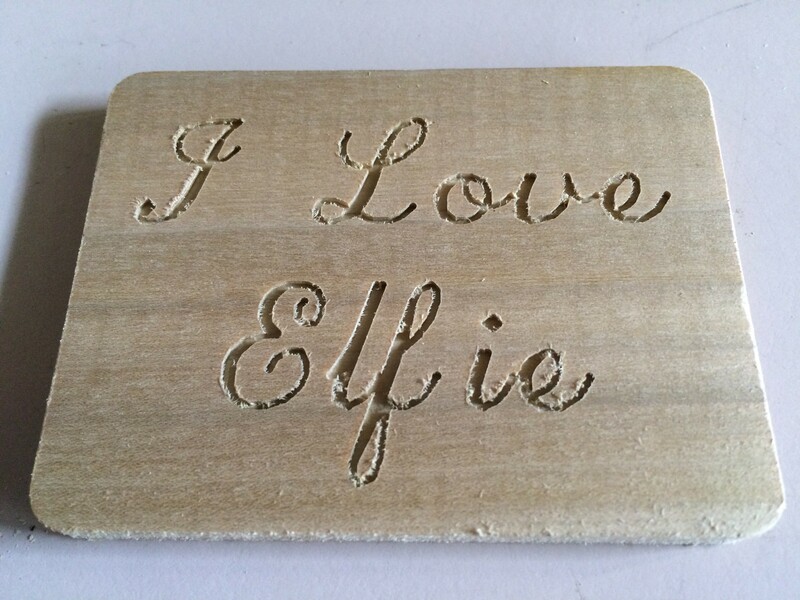 The job is a plate that my daughter wanted saying “I Lover Elfie”. Ellie is our new kitten. The job ran well. Here’s how it finished up. I was doing my head in trying to find out why I was skipping steps running a job in poplar. After finding the problem occurring during an air cut I knew it wasn’t a hard spot in the material. Add some manual resistance to the Y-axis I noticed the plastic pulley rotating at a different rate to the aluminium hub. I removed the pulley and found that the plastic had split. Time to buy aluminium pulleys! The enclosure did a great job keeping dust in. The vacuum in cleaner in the corner kept a negative pressure in the enclosure preventing dust from escaping. There was very little dust collecting on the top of the router. I’m confident there we next to no dust circulated through the inside of the router. Dust did collect in various places on the inside of the enclosure. Overall I’m very happy with how it performed. Make sure the collet is done up nice and tight. It’s not good when the router bit pulls out. Clean the rails and rollers between jobs. Dust on the rollers can cause the steppers to mis-step and lose position. Keep the feeds & speeds within the capabilities of the stepper motors on each axis. If the stepper torque is exceeded it will mis-step and lose position. 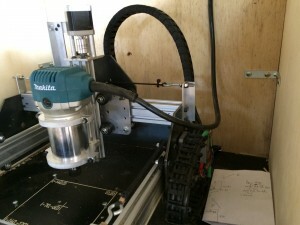 I will need to find a way to calculate cutting forces on the stepper. Added 5mm acrylic panels to the front and top of the Shapeoko enclosure. Panels are attached to one another with piano hinge using M4 x 15 bolts with nylon nuts. The top panel is attached at the back with piano hinge and the supplied screws. The white handle at the bottom from allows the front and top to lift up and rest on the top of the enclosure. 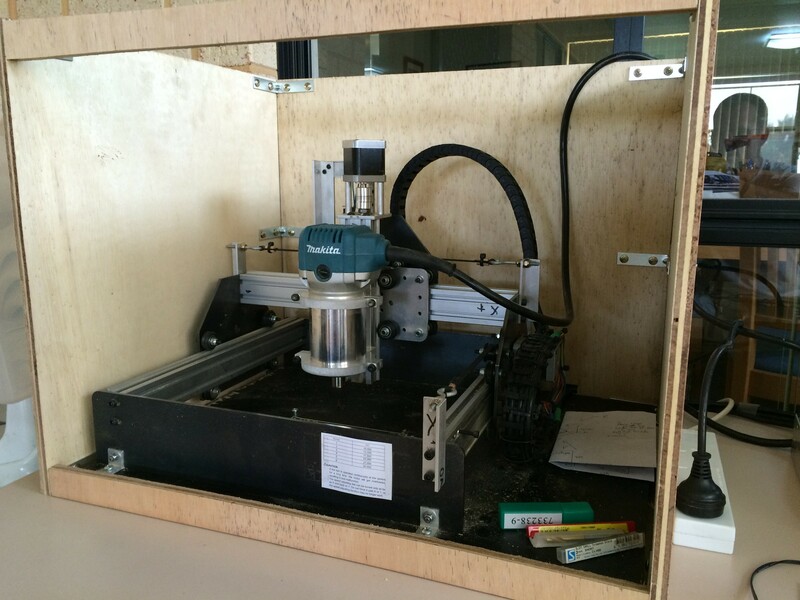 The enclosure provided 10dB noise reduction with the router running at 30,000 RPM. Hearing protection is still a must. 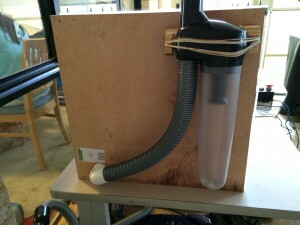 On the left side of the enclosure is a mini cyclone dust separator from and old vacuum cleaner. These can be picked up at Godfrey’s. It was effective for cleaning the floor but I’m not sure how well it will work in this installation. Next weekend I will make some work holding clamps. I suspect that the dust will be blown around the enclosure from the router. If this happens the dust will circulate through the internals of the router. Not good. If this happens I will duct the intake of the router (the top) to the outside of the enclosure. I hope the 1kW vacuum cleaner can move more air than the 700W router. 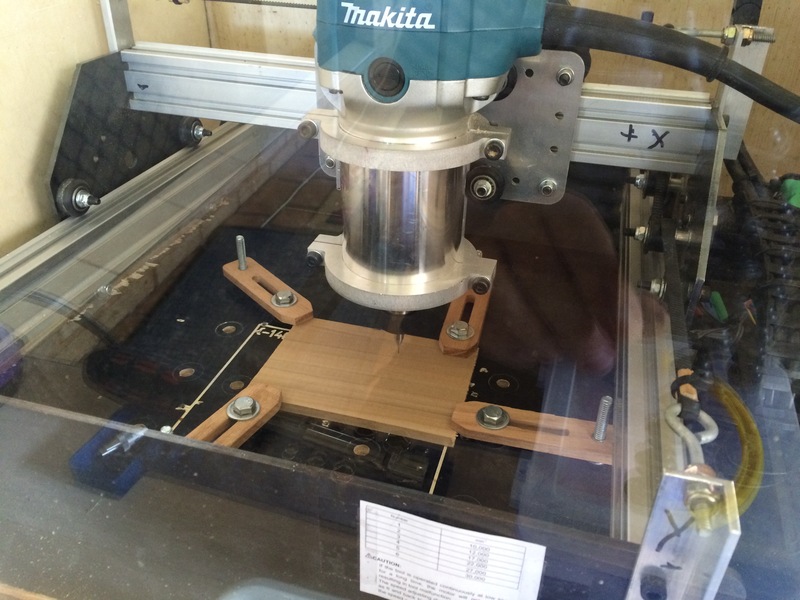 Spent today building the enclosure for the ShapeOko. Left, right, and rear sides are 12mm ply with bracing at the front top and bottom. The panels are held together with screw on angle brackets. The top and front have been left open for a perspex hinged cover to be added later. A hole will be added on the left side at the back for a vacuum to be attached to collect dust. Here is a closer view of the cable management with drag chain. And finally a picture of a Christmas decoration made with my ShapeOko. Combined stepper and limit switch wiring into a single 7 core cable. Discovered the stepper signals interfering with the limit switches. Installed 0.47uF electrolytic capacitors to smooth out the signal. Thank to this link for the solution. Added touch plate and alligator clip for the new probe cycle. Also need a capacitor to fix interference problems. The new probe cycle greatly simplifies the process of setting the Z height. I like it a lot. I’m using a piece of un-ethced PCB which measures 1.6mm thick. I put this on the top of the workpiece, run the probe cycle (G38.2 Z-100 F50). 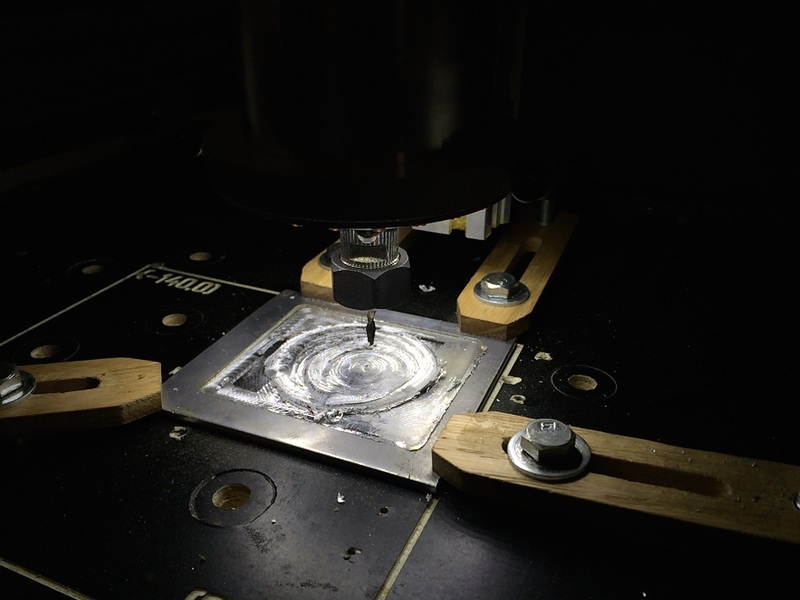 When the tool touches the top of the PCB I subtract 1.6mm from the Z position and set the tool offset with G43.1 Z(position – 1.6). I ran a couple of jobs with a 3mm, 2 flute cutter on poplar (soft wood). Initially the tool load was too high at 30,000 rpm and 750 mm/min feed. This caused the steppers to mis-step and lose position. After dropping the feed to 250 mm/min everything was OK. 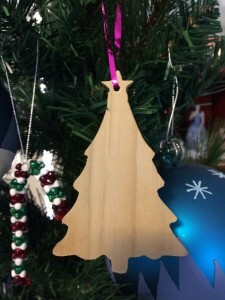 I finished the day by make a Christmas tree shaped ornament for the Christmas tree. Enclose the mill to control dust and noise. Currently there is a lot of dust and a lot of noise. Control the router with Super-PID. Fully enclose the electronics, including power supply. 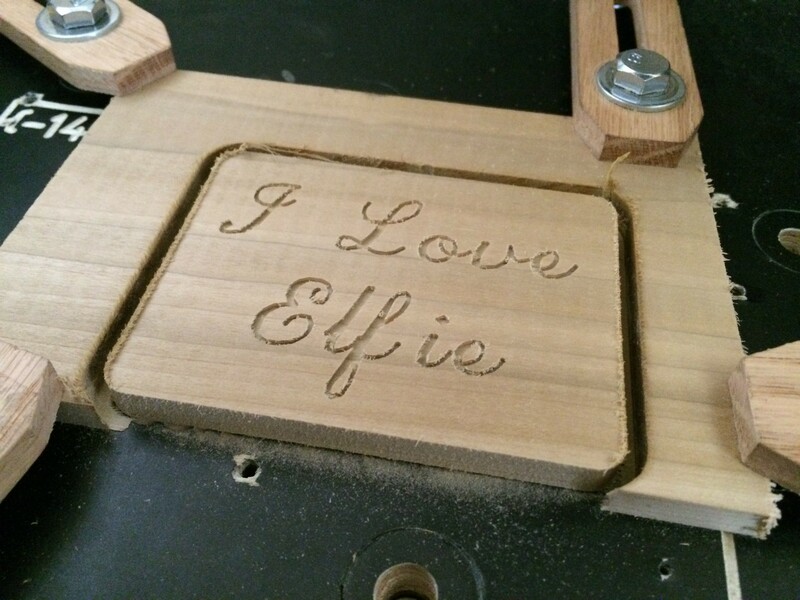 Upgrade the frame to be similar to ShapeOko v2.0. Get a T-Slot Table Plate to replace the waste board. 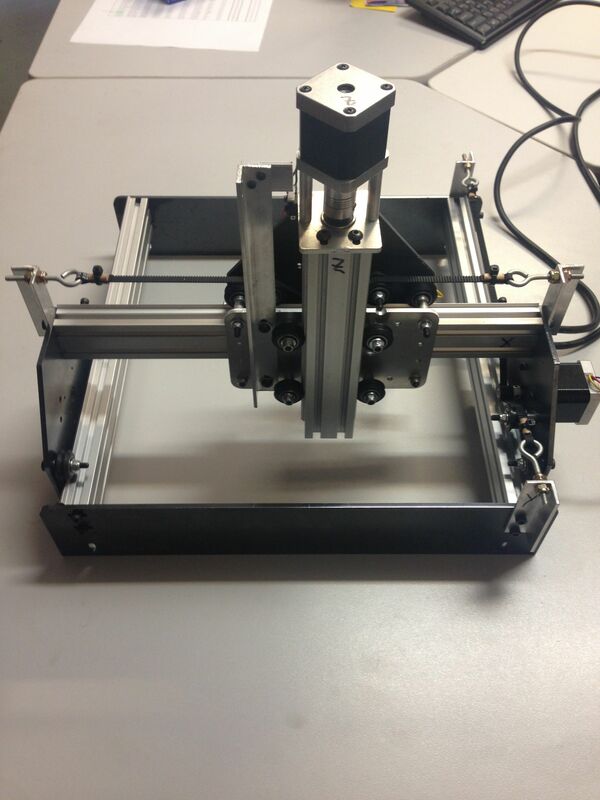 Modify X and Y axis drives to NEMA 23 steppers with dual steppers on the Y axis. Modify the belt drive taking inspiration from Bell Everman. Replace the Z axis M8 standard all-thread with SS all-thread for better accuracy. 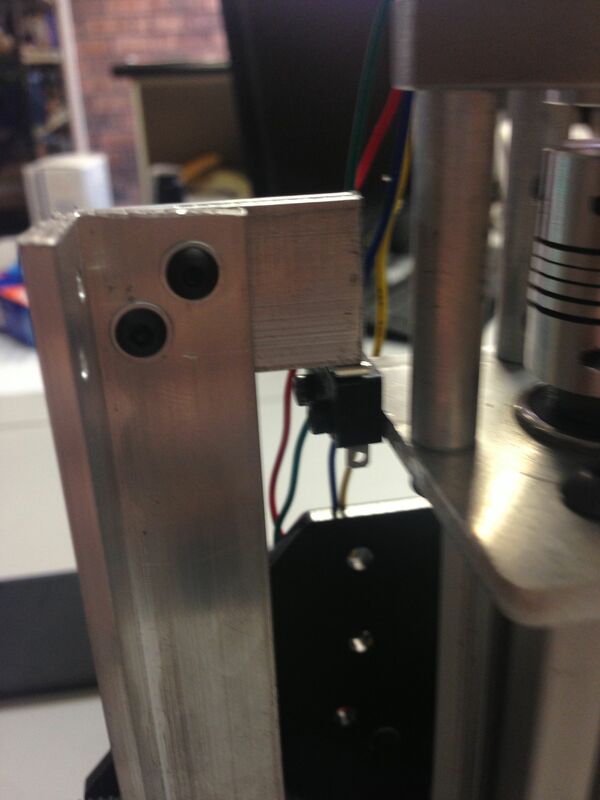 The stop for the Z-Axis limit switch was installed today. This allows the axis to retract away from the table. The limit switches for all axes have been wired up. Homing the axes also works. The direction for each axis has also been adjusted. I also did the first real test run of the machine by drawing “Hello” with a pen in a nice font.